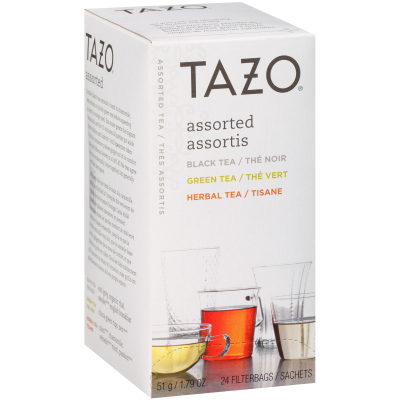 Delight the diverse tastes of your guests with Tazo Assorted Hot Tea Filterbags. Offering eight varieties of black, green, and herbal hot tea, this assortment features rich, imaginative blends of tea leaves, botanicals, and spices for joyful sipping any time of day. This tea variety pack includes individual filterbags ideal for restaurants, cafes, hotels, and office environments. This assortment of favorite Tazo teas comes with 3 envelopes of each flavour: Awake English Breakfast, Earl Grey, Chai, China Green Tips, Zen, Passion, Calm Chamomile, and Refresh Mint tea bags. Whether you're an office manager looking to ignite the creativity of your workforce, or a café owner in search of a deliciously unique flavour offering, you will love serving these teas that inspire joy and wonder with every sip.